Illustration of Sapphire Energy’s Integrated Algal Biorefinery, cultivation and extraction facility now under construction in Columbus, New Mexico. 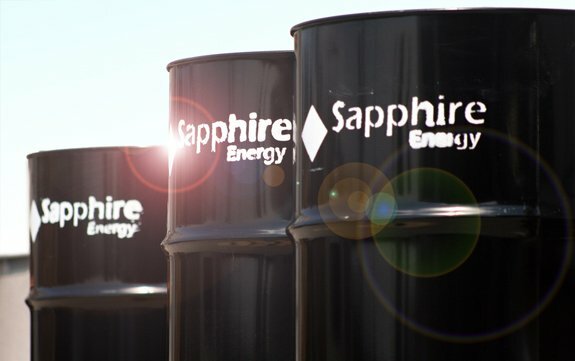 hat from your background in gas and oil applies directly to what’s going on right now at Sapphire? C.J. : Oh boy! I draw from it everyday – from project management and engineering construction, to troubleshooting issues out in the field, integration of different technologies, managing team dynamics and systems for determining what our performance should be and driving to it, to understanding the energy industry and what our goals should be in order to be competitive in that kind of world. All of those things come into play. Do you see this as an industry today? Tim: I’d say we’re close. What’s different between last year and this year, as you can clearly see at this ABS conference, is having all those vendors in there trying to sell us stuff! C.J. : Which means, by definition, you’re a proper industry! So what do you think is the state of the algal industry today? How would you describe it to someone? Tim: I’d say the industry continues to defy the timeline for commercialization set by others, and more and more experts are learning that some of the timelines that we’ve been talking about since the day we launched the company are much more real than others thought them to be. We’ve become much more mature as an industry. We have the ABO becoming a real industry association with their voice and credibility helping us on the government side as an industry, rather than each company just doing one-offs in Washington. The companies are growing up. We’ve had one of our colleagues – Solazyme – go public. We’re building a commercial demonstration facility, which is the largest in the world. A lot of good things are happening. Another way to recognize us as an industry is just the recognition we now have in Washington. People respect and know what we’re up to, and they know what our position is on energy issues. What role do you think government should have at this stage of the industry? What do you think is realistic, what do you think it should be? The government needs to lead, and lead in ways that help us get through the tough times, which is: we need capital, we need their endorsement of our technology, we need them to understand that this space is viable, and that we are advancing quicker than other technologies. So that gets followed up with things like when we ask for changes to the RFS – technical changes that will help us grow as an industry – the Congressional arm of the government will follow suit. And when we ask for things like tax assistance – just parity – that we’ve met the important tests or threshold of credibility you have to meet as an industry before Congress hands over those types of things. And we’ve met those tests and I believe you’ll see parity happen as soon as there is a vehicle to do that. So, I think government is there. And now it’s incumbent upon the industry to continue to be credible – under promise, over deliver. Don’t make the mistakes of the past. We’re very cogniscent of that as a group. So, what is the toughest nut to crack in your opinion? C.J. : Well, the great news is that all the first principles have actually been proved out. So we don’t have any lurking issue that we simply don’t know how to deal with. Now what it really is all about is scale-up. And scale-up is not a simple thing, so I don’t want to minimize that. But what we know is that it is not impossible, but it’s going to take a lot of effort, and we need to be disciplined about it and not skip steps, because when you do that you risk making costly mistakes. So the more we can make sure we are really stepping our way through it, the more we can learn at the proper level and then fix it before it’s too big, and then go to the next level. It really is about ironing out all the things that you learn each time you get a little bit bigger, and then run in an integrated fashion. What would you say is the highest agenda item for Sapphire and for the industry? Making oil – green ponds and black oil. Just getting it done, because it’s the proof of concept. People’s imaginations have been captured – it’s an idea that almost sells itself, because once you start thinking about it you realize how much potential it has behind it. So then it’s really about, so, is it twenty years away? Is it two years away? The more we can just get out there and get it done, and demonstrate that it really is working, that it’s there – that’s the big thing. And the response you get from Washington is what – totally encouraging? somewhat skeptical? It’s a funny thing because it’s almost like because we seem such a strong prospect, we’re like the orphan that hasn’t gotten the same benefits that our big brothers and sisters have gotten, and that’s a real handicap. We need a level playing field and it hasn’t happened yet. But that will make a very big difference, because if you want us to have green ponds and black oil, we can do it faster with a level playing field. Who seems to be championing the cause in Washington? Tim: We are really getting more and more support – Senator Tom Udall is doing a lot, so has Senator Jeff Bingaman, but there are many people helping the cause. On the world stage, how do you see this playing out? What is the role of the U.S. in this global industry’s development? Tim: Well, our philosophy here at Sapphire is: let’s do it in America first, and the rest of the world will take care of itself. Once we get it rolling here in the United States, we’ll move on abroad, and it’s in our national interest to do that. Everybody in this government would like to see technology spread throughout the world that we develop here on our soil. So, how do I see it playing out? 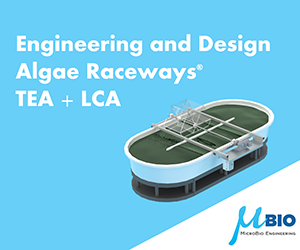 I think we are going to be successful at our IABR (Integrated Algal Biorefinery) in Columbus, and it’s going to change the way people think about algae. It’s going to support the United States’ investment in that technology in a good way, and it’s going to result in us taking this far and wide. China can’t buy its way into this technology because it’s born and bred right here by Sapphire. China can invest a lot of money, and that’s good, but at the end of the day we’re way ahead, we’re years ahead. On the other side of the coin, it’s incumbent on the United States government to recognize that we are the world’s leader in this space, and we need to do it here, and we need their support to get it done. 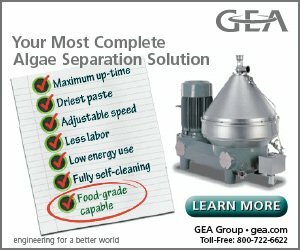 Does Sapphire plan to do the full expansion, or will it be licensing their technology to farmers? C.J. : This business model is going to morph over time for sure, so what we need to do is get it launched and develop every phase of that value chain. That includes cultivation and farming. We need to launch it so that we can create a demonstration to show how it’s done. Once that happens there will be a lot of options for how to do things. The obvious extension of it, once we know how to do it, is that there are so many farmers out there who are excited to cultivate it on their land once we’ve created the cultivation model. So, what we will do is provide seed, and then the farmers can do the cultivation. We can also provide the coop, with harvesting and extraction technology. And the refiners will continue to be the refiners and we’ll sell through to them. So that’s the most likely way the model will carry itself through. But, again, in the early days we pretty much have to occupy every element of the value chain just to get it all kick started. Will it be industrial agriculture or traditional farming that adopts this first? C.J. : It’s hard for me to say. My guess would be it’s going to be a mixture. Tim: It’s a pretty patriotic business for the farmer if you think about it. So I think both industrial agriculture and those farmers who maybe have fallow rice fields might want to put some of that acreage back into production early on. They’re not put off by the complexity, or the uncertainty, or the lack of history? C.J. : They don’t seem to be. They seem pretty thrilled with it. Tim: If you think about modern farming, whether they’re big or small, they’re using technology. They’re all using GPS strapped to their John Deere tractors. And they’re putting seed down that’s all monitored and computer controlled. They’re monitoring the weather conditions, the fertilizing conditions, so they can reduce the amount of water and fertilizer they use. They’re a pretty sophisticated crowd. Will this take subsidies to make them take the first step? Tim: I think it will take the USDA Extension Service to help, because that’s how farmers understand and learn how to do this. That’s the USDA’s university, if you will. Clearly it’s going to take crop protection. And if you want to talk about subsidies, let’s think about the subsidies already given to oil and gas. There are different models of approaching it, but energy is in our interest and we need to have a lot of it. So, if it takes a subsidy so that farmers are secure in growing it, and are protected in the event of a failure…sure, why not? Any advice to the industry? C.J. 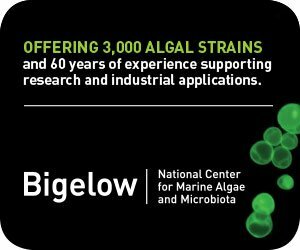 : I would encourage the whole algae industry to just keep at it, because we’ve made so much progress in the last couple of years. You can see it. You can feel it happening. And what we’re doing is so essential, and it needs all of our different ideas and success. It’s about keeping after it and getting to scale and getting those demonstrations going.